Inspect A Home's Services - Why get a Home or property Inspection? A property, building or home inspection is a valuable tool to have so you can make an informed decision when buying or selling property. Our goal is to provide an unparalleled, professional property inspection service – the kind that only our Inspect-A-Home independent franchise operators are trained and equipped to offer. From inception, Inspect-A-Home has used its extensive experience to help clients make informed decisions when buying property, as well as guiding and supporting them when building. Why get a Property or Home Inspection? When buying property, you accept that not everything is perfect but ut you also don’t need any nasty surprises in the future like unforeseen repair costs. The purpose of a home inspection is to identify all the existing defects, understand their implications and suggest possible solutions for fixing problems. The inspections are thorough, taking approximately 2-3 hours to complete because the property inspection covers every aspect of the property from roof to boundary walls. The Inspect-A-Home report is not a home inspection check-list or computer software generated report. Each report is written from scratch, specific to each property. The representative sent out by a bank is simply an evaluator (and not a home inspector). They are looking to protect the interest of the bank by making sure that the property is worth the mortgage amount. The bank sometimes does not send anyone at all. If it believes that the risk is small – this is their prerogative. The bank’s evaluator does not check that you’re getting a good or fair deal. The inspector from Inspect-A-Home does not evaluate or assess the value of a property. The inspector does not recommend to the client whether or not to purchase the property. The exact purchase price is irrelevant to the home inspector because the inspection cost is not based on the value of a property. With all due respect to estate agents, no matter how experienced they may be, they do not have the knowledge, expertise or experience required to identify and evaluate defects like an Inspect-A-Home inspector can. Estate agents are supposed to inform the buyer of defects disclosed to them by the seller, but often even the seller is not aware of some of the defects on the property. Given that all property requires maintenance, the property inspection report reveals the more serious (potentially expensive) defects that may not have been disclosed by the seller. This new information can be used to have the repairs done before occupation. The report cannot be used to escape any offer to purchase agreement and will always be objective and factual. All our home inspections are thorough, covering every aspect of the property from the roof to the outside boundary walls. External: Roof, flashing, gutters, roof cavity, plumbing in the roof cavity, geyser installation compliance, eaves, super structure, windows, doors, balconies and patios. Internal: Floor covering, skirting, windows, doors, walls, cupboards, fittings, cornices, ceiling. Bathrooms: shower, bath, basins, toilet, tiling, fittings. Outbuildings: Staff quarters, storerooms, garages, swimming pool, water runoff, storm water drainage, gates, boundary walls. It’s advisable to obtain plans of the property and make these available to the home inspector to confirm that no unapproved building additions or alterations have been made to the property. 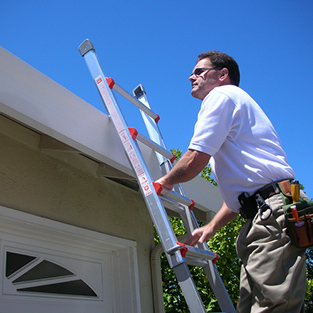 Inspect-A-Home does not only report on visible defects, but gives preventative and maintenance advice as well. If there’s something that Inspect-A-Home knows from experience that can be problematic in the future, it will be reported on. Then, if the advice is followed, this may save thousands of rands in future repair costs. The disclosure of the rectification work required on most, if not all of home inspections, is invaluable. It’s advisable to add the clause: “Offer subject to a favourable property inspection report by Inspect-A-Home”. If the purchase offer is accepted and Inspect-A-Home is called to do the inspection, access will be arranged with the relevant estate agent or seller. The time it takes for a home inspection is approximately 2-3 hours based on a standard 3 bedroom house. After the property inspection is completed, the Inspect-A-Home inspector will contact the client and give a verbal summary of defects found. The written property inspection report is then compiled and submitted to the client within 72 hours. The report is strictly confidential and issued to the client only. If the client wants further copies to present to the estate agent or seller, that is their prerogative, and this can be supplied at no extra charge.